Copper caps are used to terminate one end of a copper pipe. These sweat fittings can be installed by soldering it to the pipe. We offer durable copper caps that are guaranteed to get the job done. The P-5 from Everhot is a 1” Copper Cap. It's used to terminate the end of a copper pipe. .. The P-7 from Everhot is a 1-1/2” Copper Cap. It's used to terminate the end of a copper pipe. .. The P-8 from Everhot is a 2” Copper Cap. It's used to terminate the end of a copper pipe. .. The P-3 from Everhot is a 1/2” Copper Cap. It's used to terminate the end of a copper pipe. .. 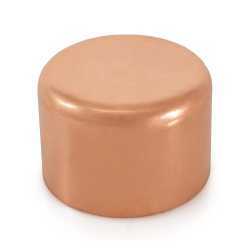 The P-4 from Everhot is a 3/4” Copper Cap. It's used to terminate the end of a copper pipe. .. The P-6 from Everhot is a 1-1/4” Copper Cap. It's used to terminate the end of a copper pipe. ..